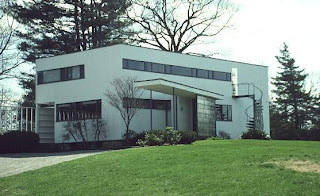 Gropius's career advanced in the postwar period. Henry van de Velde, the master of the Grand-Ducal Saxon School of Arts and Crafts in Weimar was asked to step down in 1915 due to his Belgian nationality. His recommendation for Gropius to succeed him led eventually to Gropius's appointment as master of the school in 1919. It was this academy which Gropius transformed into the world famous Bauhaus, attracting a faculty that included Paul Klee, Johannes Itten, Josef Albers, Herbert Bayer, László Moholy-Nagy, Otto Bartning and Wassily Kandinsky. One example was the armchair F 51, designed for the Bauhaus's directors room in 1920 - nowadays a re-edition in the market, manufactured by the German company TECTA/Lauenfoerde. In 1923, Gropius designed his famous door handles, now considered an icon of 20th-century design and often listed as one of the most influential designs to emerge from Bauhaus. He also designed large-scale housing projects in Berlin, Karlsruhe and Dessau in 1926-32 that were major contributions to the New Objectivity movement, including a contribution to the Siemensstadt project in Berlin.